Sequestering carbon dioxide underground is likely to play a key role in meeting reduction targets set at the IPCC conference in Paris last year. Researchers at EPFL have developed a simulation tool to evaluate the impact of the injection process on the host rock. 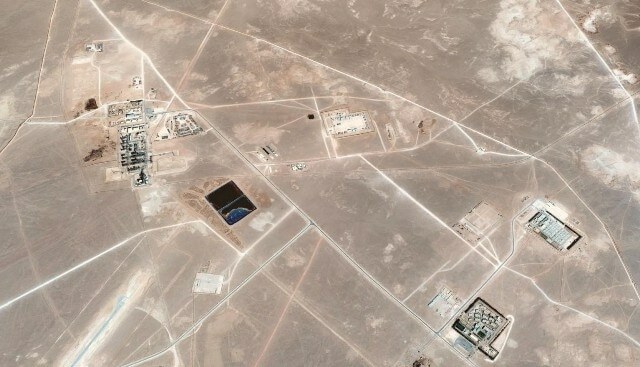 Over the course of four and a half years, the ground surrounding the In Salah gas-fired power plant in the Algerian desert rose by sixteen millimeters. This rise was triggered by the injection of the carbon dioxide emissions captured at the plant into a deep aquifer, 1800 meters underground. The heaving of the bedrock at In Salah was benign, but injecting excessive amounts of gas into the subsurface could potentially fracture the impermeable rock layers keeping the gas in place. Researchers at EPFL have developed a computer model that simulates the geological impact of injecting CO2 underground and assess how much gas a reservoir can safely accommodate. They published their results in the International Journal of Greenhouse Gas Control. Underground CO2 sequestration is already being used at several sites around the world to keep the greenjouse gas out of the atmosphere. The Paris agreement, which seeks to limit the extent of anthropogenic climate change, will likely accelerate the adoption of this technology, which according to a study published in 2010 could be feasible in parts of Switzerland as well. The complex and highly variable geology of potential sequestration sites around the world call for the development of tools to determine under what conditions their impermeability can be assured. The injection phase is most critical, says Li Chao, a researcher at EPFL’s Chair “Gaz Naturel”-Petrosvibri and co-author of the study with Prof. Lyesse Laloui. “When CO2 is injected into a deep aquifer, sometimes thousands of meters underground, it is much cooler than the surrounding rock and compressed to the point that it occupies 500 times less volume than it would in the atmosphere. Because of its temperature, its pressure, and the volume it occupies, it interacts with the surrounding rock ” he explains. This can deform the rock, causing geological instabilities, and in the worst case, fracture the cap-rock that seals the aquifer, allowing the gas to escape to the surface. Chao says he can use his simulation to determine the pressure up to which CO2 can safely be injected in a given geological setting. To test it, he and his co-author attempted to replicate the observed heaving in In Salah, caused by four and a half years of CO2 sequestration. While the cold gas contracts the host rock surrounding the injection site, its high pressure increases the size of the pores in the rocks. By coupling thermal, hydraulic, and geomechanical processes in one simulation, Chao and Laloui were able to determine how these competing forces conspire to shape the reservoir and the rock layers above and around it. “Our simulation results came very close to matching the satellite observations,” says Chao. In the future, he hopes to further develop his model, which can be applied to other types of CO2 sequestration sites, from abandoned oil or gas fields, to saline aquifers, to simulate for the formation of fractures in the bedrock.